Black Wood is the new release from Irish writer Derek Flynn. Just published, it is a thriller that questions how far we are prepared to go to achieve our hopes and dreams. The tale is told through the narrator, a man in his 30s. Originally from small town America, he is now living in New York, teaching in a local college. He unexpectedly receives a call from a old school friend, a girl he had always had a crush on, Samantha. She is terrified and is looking for his help. He had lost contact with his high school acquaintances many years previously after an incident that impacted his life, and others, for years to come. Now Samantha is claiming that she is being blackmailed and needs his help, urgently, to uncover the source of this threat. Samantha is frightened. She has always known this moment would come but why now? What does this person want? 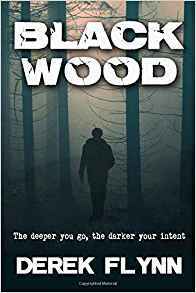 Surviving high school is a typical teenage experience for many kids but twenty years previously, something bad happened in a place known locally as the Black Wood. The Black Wood was a place where the kids hung out, drinking, taking drugs, seeing ‘how far’ they could go, but for Samantha and our narrator it holds some very twisted memories. Now a shopping mall, the woods are long gone, but the memories remain. As the hunt for the blackmailer continues, snippets of their past is revealed and we get to fit the pieces together and unravel the complex threads…. What did happen that fateful night in the Black Wood? Black Wood is an engaging tale filled with dark, sinister undertones and secrecy. Packed with deceptions and lies, it takes the reader on a tense and suspenseful journey as the truth is slowly revealed.